Instrument Cabinet Organization – FREE Download! To download instrument cards DOWNLOAD HERE! There is nothing more potentially frustrating than managing instruments. There are so many of them, and they are often odd shapes. They need to be accessible and they need to have a place. When possible it is also best if they are organized so that my students can put them away without a lot of fuss. 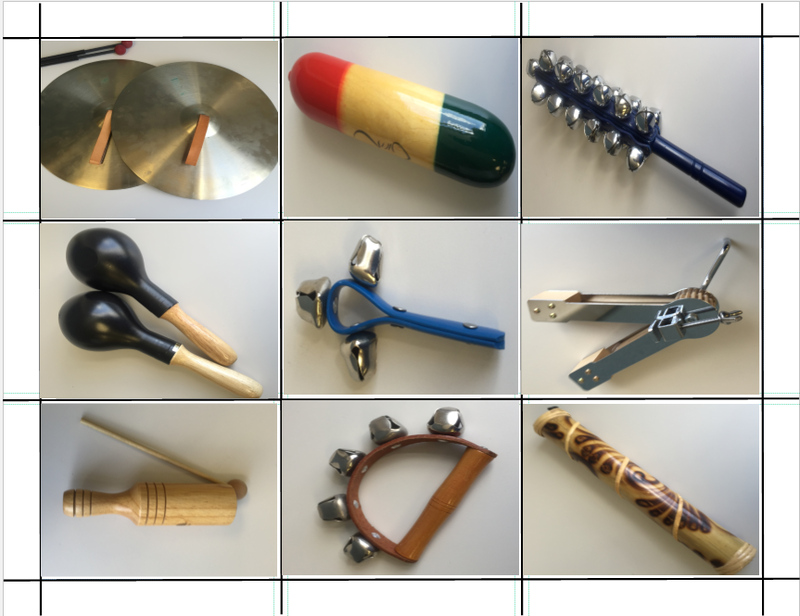 I am beginning my 3rd year at my current school and I’ll admit that I didn’t even know I had some of these instruments simply because I hadn’t had a chance to look at everything. I inherited a very well organized collection. Everything was neat and labeled which made it easy to find the essentials, but part of the fun of being in music class is using the odd and novel instruments. To say that I have under-utilized this really cool collection of instruments was an understatement. I want to do better! In order to help myself remember the delights contained in my cabinet of musical wonders I needed to organize my instruments in a new way that will help me get to the instrument I’m wanting without a lot of time playing hide and seek. I printed enough pictures so that I could tape one on the container, the lid and either the shelf or the door. I have a cabinet where I keep most of my instruments and a shelf where I keep the ones that I constantly have out. You’ll notice in the picture at the top of the page that the instrument pictures on my cabinet door are not completely taped down. I didn’t fully tape them down yet because they aren’t straight AND because I’m not done setting up my room. I may find that I need to move them to accommodate for other materials, so for the next few days they are still loose. They will be easy to move if I need to move them because they are laminated and won’t stick to the tape. I’m hoping to find the time to add numbers to the shelves and the doors so that I can tell my helpers to get the jingle bells on shelf 3, or the wrist bells on shelf 5. I don’t know if I’ll get it done, but I may… I tried to put lighter instruments on the top shelves so that if a 3rd or 4th grade student has to stand on their toes to reach the instrument, they won’t get bonked on the head. If you decide that you want to make your own so that your pictures look like the instruments you have in your room, HERE are the instructions. 1. Take pictures of all of your instruments and use a photo editing application to crop them so that each photo looks centered. 5. This is the guide I use most often. I use it any time I want to create cards or game pieces. You can create custom guides if you want your boxes to be a different size. 6. Place your photos in the grid, resize as necessary and print.